At Capital Exhibits, we offer high-quality, 100% green Outdoor Interlocking Comfort Tiles. This high-density compressed foam can be configured into any size for an expo booth, retail stores, hotels or convention space. We understand finding top-quality flooring for trade shows is important to you and we offer only those products! Coming in a variety of colors, this flooring makes it easy to complement any existing exhibition marketing tools such as display stands. With an optional beveled edge, installation is simple. Outdoor Interlocking Comfort Tiles come in 2 feet by 2 feet tiles that are 3/8” thick that are lightweight, making them a durable and portable option for your next event. They are easy to assemble and easy to clean too. Who doesn’t like that? Made of a closed-cell EVA, they are topped with a brush-look finish. This closed-cell EVA foam doesn’t absorb water making them waterproof and slip resistant too. They are also UVA/UVB resistant from the sun, meaning they are unaffected by the elements and will last a long time. This product is also made in the USA and only of 100% green materials. 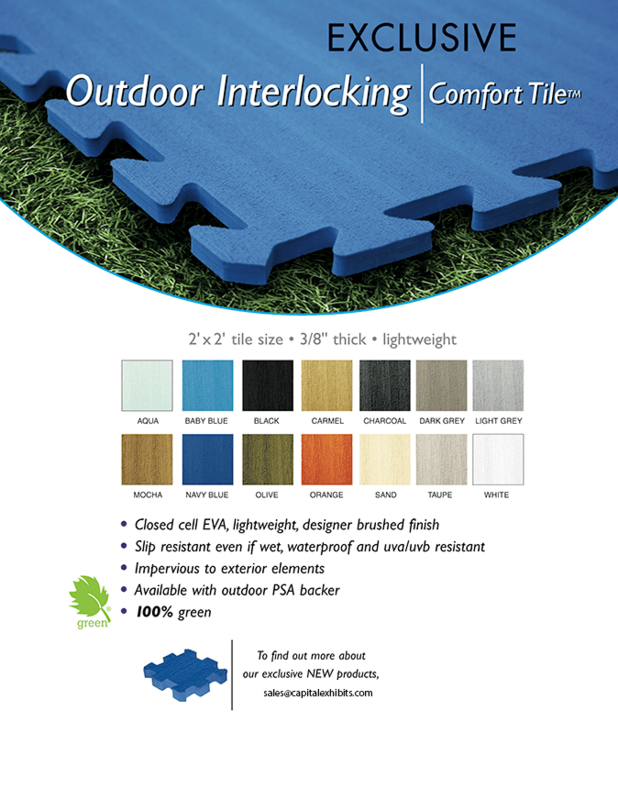 Ultimately, this flooring option is a great addition to any event, both inside and outdoor, and would work great for trade shows of all types. Coming in 14 different colors, it’s easy to find one that works best for your existing booth design or what your vision is for your exhibit. These tiles are also anti-fatigue, which leads to a comfortable addition to your booth when you’re standing for hours at a time. They also work great at retail shops, hotels or restaurants too as they help ease the aches of busy feet. These tiles are custom made to order. For more information on outdoor interlocking comfort tile and what options we have available, contact our professional team at Capital Exhibits today!